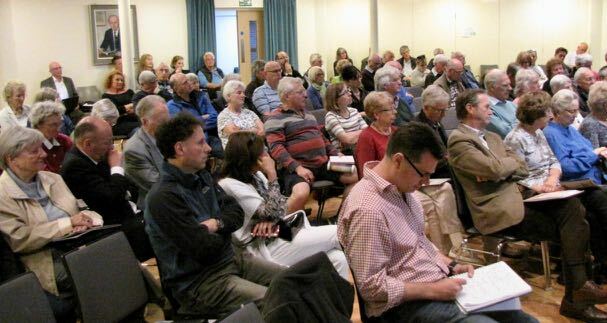 Vociferous disparagement of the proposal to more than double Luton Airport’s passenger handling capacity and number of flights came from some 130 local residents at a public meeting in May convened by the Harpenden Society. Their almost universal condemnation of the plans was directed at three Luton Borough councillors who sit on the board of London Luton Airport Ltd, (LLAL) following their detailed presentation of the expansion project. The audience in Rothamsted Research’s Fowden Hall heard Hazel Simmons, leader of Luton Borough Council - the airport owner - LLAL chairman Andy Malcolm and chief operations officer Robin Porter, outline its ambitious and far-reaching plans for the next three decades. good neighbour’ to surrounding communities and to that end it would be expanded ‘sustainably’, without the need for either a second runway or a lengthening of the existing runway. She maintained that the planned expansion, at a cost of some £1.5 billion, would bring more prosperity for the whole area, not just for Luton, claiming that the airport already supported, directly or indirectly, some 30,000 jobs. Mr Malcolm said 16 million passengers passed through Luton Airport in 2017, of which, incidentally, catchment area surveys had shown, about 5 million were from London and some 3 million from Hertfordshire. The airport was therefore approaching its present theoretical capacity of 18 million passengers per annum (ppa), a level expected to be reached by 2021. Luton Airport’s vision for the decades up to 2050 was for passenger capacity to increase to between 36 and 38 million ppa. The job of the airport management team was, declared Mr Malcolm, ‘to actively manage the environmental impacts through responsible and sustainable development’. But it was clear from the Fowden Hall’s audience reaction that his assertion was widely regarded with disdain, one resident claiming that ‘aircraft noise already made life a misery’. He hastened to remind them however that the proposal to at least double the airport’s capacity was, for the first time in its 80 years of growth, contingent on planning approval, not from the local authority - with its built-in vested interest as the airport owner - but from central government. The Secretary of State for Transport’s remit would necessarily involve an enquiry on meeting predicted long-term civil aviation demand for all of the Greater London area, with the mooted third runway at Heathrow an inevitable contributory factor. A planning timetable had been established. A 10-week ‘non statutory’ stakeholder consultation would begin this summer, followed by a statutory consultation scheduled for June next year, leading to the submission of an application to the Secretary of State in late 2019, with the ‘hope’ (Mr Malcolm’s word) of securing planning consent some time during 2021. David Williams, leader of Hertfordshire County Council (HCC) and a Harpenden Town councillor, speaking from the floor, gave an assurance that HCC would be closely involved in the planning consultations. 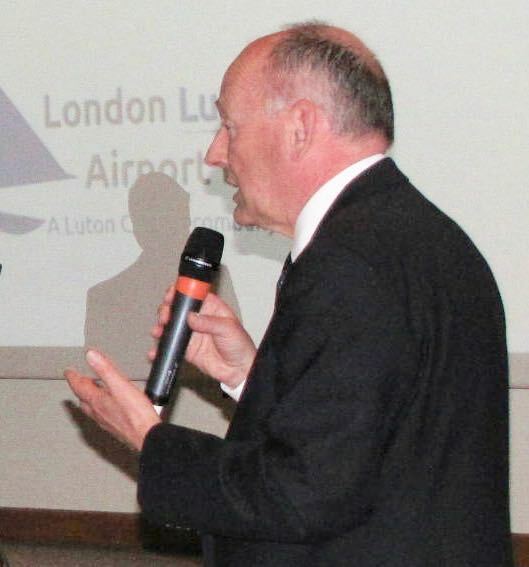 Mr Porter alleged that the projected doubling of flights and passenger numbers could be achieved with minimum additional aircraft noise or road traffic disruption - something disputed vigorously by many in the audience, based on today’s local airport-related headaches. They cited regular noise disturbance, especially at night, and increased congestion on routes to and from the airport, notably the A1081 and Lower Luton Road through Harpenden, as well as the current crowding on Thameslink trains - before any further airport expansion. While admitting that airports were, by definition, ‘smelly and noisy’, Mr Porter said the noise issue in particular was being addressed through a number of measures. There had recently been a narrowing of flightpaths that were routed over less populated areas, and a requirement for today’s (less noisy) aircraft, after take-off, to climb more steeply, reducing their noise ‘footprint’. Planes taking off to the west would be required to reach an altitude of 1000ft by the time they crossed the Thameslink rail line. Meanwhile, he added, a new three-minute rail link costing £225 million, connecting Thameslink’s Luton Parkway station to the airport terminal was under construction. It was designed to encourage more passengers to arrive and leave by rail rather than by car. The airport was liaising with Thameslink to improve capacity of trains serving Parkway station. However, few in the audience above appeared convinced that the planned airport expansion over the coming decades would yield worthwhile benefits for those living in its hinterland, despite Ms Simmons’ ‘good neighbour’ pledge. 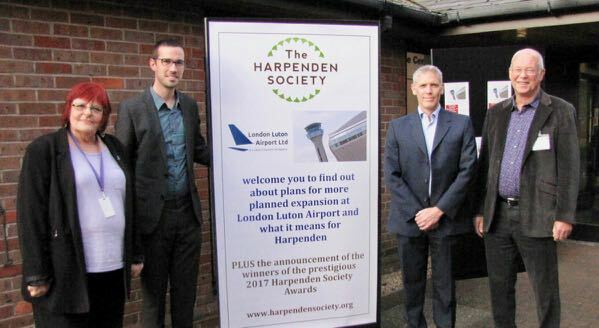 Above from left to right: Hazel Simmons, leader of Luton Borough Council - the airport owner - LLAL chairman Andy Malcolm, chief operations officer Robin Porter and Alan Jackson, acting chairman of The Harpenden Society. Below - The Dart rail link train. ‘I had the honour of speaking to the Harpenden Society in September (back when I was a fresh-faced new MP! ), and faced a bit of a grilling from my constituents. It was a brilliant event, so to be invited back to write for your newsletter is wonderful. ‘I spoke then about planning in Harpenden, and how the town itself feels like a village. While there is no question that more housing is needed, planning should respect and reflect the existing community. ‘Another hugely important issue facing Harpenden which will have an impact on the atmosphere of the town is the recent and future proposed expansion of Luton Airport - the subject of this newsletter’s front page report. Since being elected, I have paid close attention to the issue and the effect on Harpenden, in particular the increase in noise and impact on existing infrastructure. ‘Increasing the number of planes landing at Luton by such a huge amount, with the number of passengers every year set to rise from 18 to 36 million, will have massive side effects when it comes to noise, which is not only annoying but also disruptive. People choose to live in Harpenden for many reasons, including its closeness to both areas of natural beauty and London, making it a very popular area. I do not want to see people leaving Harpenden, which is a fantastic place to live, because of a noisy airport (or because of train service problems!). ‘Another issue that further expansion of the airport would bring is the effect on roads, rail, and parking. Existing infrastructure needs to be overhauled to cope with the sheer increase in the number of people who would be flying in and out of Luton. It is essential therefore that the infrastucture upgrade comes before and not after any airport growth, and that it must meet long-term demands. Likewise with the need for more housing in and around Harpenden - there must be an understanding of the wider impact of growth, and not just a sticking plaster solution.